1. Using electric beaters, cream together the butter and sugar for 3-4 minutes, until pale and fluffy, then beat in the orange zest and egg. Sift the fl our, baking powder, spice and a pinch of salt over the top, then add the remaining ingredients and mix everything together to an even dough. Flatten into a puck, wrap in cling fi l m and chill for at least 1 hour, or until firm. 2. Preheat the oven to 180˚C, gas mark 4. Roll the dough out on a lightly floured surface to the thickness of a £1 coin. 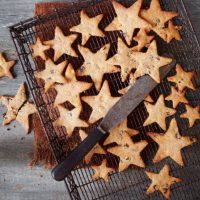 Using festive cutters, stamp out biscuits and transfer to a parchment- lined baking sheet. Re-roll any scraps until you have about 30-40 biscuits. 3. Sprinkle the biscuits with the extra 2 tbsp sugar and bake, in batches, for 15-18 minutes (depending on size), until crisp and lightly golden. Cool on the trays for 3 minutes, before transferring to a wire rack to cool completely. This recipe first appeared in Waitrose Food magazine. myWaitrose members can download the Waitrose Food app edition for FREE. Find out more. This recipe was first published in November 2015.